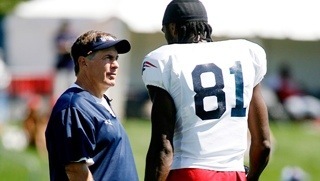 Randy Moss: This almost seems unrealistic, but we all know Moss loved being here and Belichick has no problem dealing with difficult personalities. Moss, 35, is still probably one of the best deep field threats in the game. Reggie Wayne: I don’t exactly see this being the ideal fit in New England, but if the Pat’s lose Branch it is certainly a viable option as I see them being a similar type of receiver. Brandon Lloyd: Lloyd is more of what the Patriots need. His big play ability will keep safeties back a few more yards, which could make the Patriots underneath passing game one of the best ever. Robert Meachem: Possesses good speed and could be a good fit alongside Welker in this Patriots offense. Ted Ginn: Certainly will not be the completion to the puzzle as a receiver but with Ginn’s versatility and elite speed he could be a great fit in New England. This entry was posted in Patriots and tagged boston sports blog, branch, ginn, lloyd, meachem, ochocinco, patriots, Randy Moss, reggie wayne, welker by davecouture. Bookmark the permalink. they should consider drafting kendall wright from baylor with the 1st pick they have(24th?) guy has speed and reminds me of a young steve smith. has gotten much better this season playing with an elite QB like RG3, could see him jumping right into the pats O with TB12. also can return punts and kicks a spot where the pats don’t get much production from. Did you read what was written about Ginn? He’s obviously not the option as a receiver but I’m sure he could help out on kick and punt return and also be a fill in as an occasional deep field threat. Keith if he falls into their lap at that pick I think it would be a great move. The Patriots don’t have that true breakout receiver at all.